This is a chart about the evolution of the price of gold in euros around 1970, approximately the period during which Nixon decided to put an end to the fixed convertibility of the USD (United States Dollar) into gold. Just to give you an idea of the global phenomenon of inflation regarding currencies. 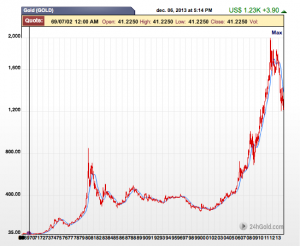 For instance, with the financial crisis, price of 1kg of gold rose from around 20.000€ to around 40.000€. THIS is a bubble obviously ! A huge decrease in the value of gold started a few months ago when the central bank of Cyprus decided to sell its own gold. Gold Prices decreased a lot, around 5000€ less for 1Kg within only a few hours. But globally, the most important question is whether or not gold value has been increasing a lot since Nixon decision or not. You should be familiar with the fact that the FED used to create a lot of money during the Viet Nam war. This is the major reason why foreign countries decided not to trust the USD anymore. So, is it gold value which is has been increasing of currencies value which is decreasing ? This is the key question. The European Commission announced today (4 December) it is hitting seven banks with a record total of €1.7 billion in fines for participating in a cartel to rig two global interest rate benchmarks. Four of the banks are accused of colluding to set interest rate derivatives for the euro (Euribor). Six of them colluded to fix the rates for the Japanese yen (Libor). Both decisions were adopted under the Commission’s cartel settlement procedure after a two-year investigation. Fines were reduced by 10% because the banks agreed to settle. Deutsche Bank and Royal Bank of Scotland participated in both activities and will pay fines of €705m and €391m respectively. Société Générale only participated in the euro-fixing and was fined €446m. JPMorgan and Citibank participated only in the yen-fixing and will pay €79.8m and €70m respectively. Broker RP Martin was fined €247,000 for facilitating the cartel. Barclays and UBS have also admitted they participated in the cartels but did not receive fines because they alerted authorities to the issue. “What is shocking about the LIBOR and EURIBOR scandals is not only the manipulation of benchmarks, which is being tackled by financial regulators worldwide, but also the collusion between banks who are supposed to be competing with each other,” said Joaquín Almunia, European commissioner for competition commission. La commission européenne vient aujourd’hui d’infliger de lourdes amendes à plusieurs institutions bancaires et financières internationales pour les sanctionner de s’être entendue sur les taux de certains produits dérivés exprimés en euro mais aussi en yens. Je suis particulièrement enthousiasmé de cette décision et des amendes, qui ensemble, représentent 1,7 milliards d’euros. Et je ne peux m’empêcher de penser à cette interview de Dominique Strauss Khan, qui disait sur CNN, que le système bancaire européen était malade, et ne s’était pas réformé après la crise comme on a pu le constater aux Etats Unis.